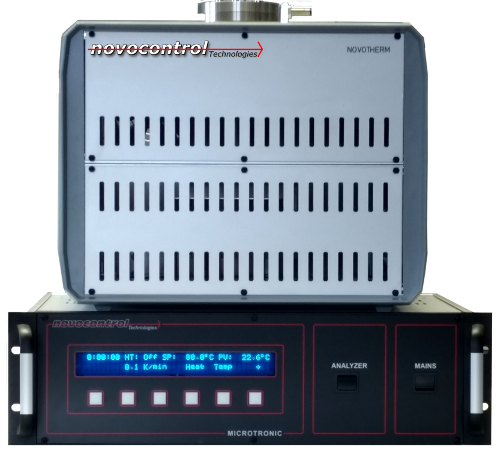 Novotherm is an economical turnkey temperature control system for applications in material research. In contrast to the cryosystems, Novotherm works with air instead of liquid nitrogen from ambient to 400 °C. It can be used with all Novocontrol sample cells for dielectric and impedance spectroscopy. 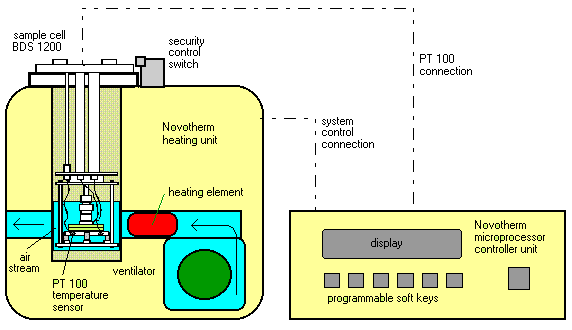 Novotherm was designed for easy, safe and fully automatic operation enabling computer controlled experiments over several days without supervision as required for low frequency measurements. The intended temperature (setpoint) is set at the controller unit either manually or by computer control. The actual temperature at the lower plate of the sample electrode is measured by a Pt100 temperature sensor. A high pressure fan creates an air stream which passes a heating element and flows around the sample under test. The controller adjusts the air stream temperature in order to match the actual sample temperature to the setpoint.